Another batch of Spider-Man DLC is out now, and you know what that means—hot new spider-threads to collect, and take pictures (pictures of Spider-Man!) with. This time around, all three new suits are actually from the comics, so here’s a quick little primer to their origins on the page. As you might guess by the name—and its crimson/gold colour palette—the Iron Spider suit is named such because it’s a costume designed for Peter by Iron Man himself, Tony Stark. In Civil War, Tony advocated for superheroes to register their secret identities with the government to publicly act as licensed heroes. He convinced Peter to join him and publicly announce his identity as Spider-Man, and he also constructed Peter an actual protective suit, noting his usual costume was literally just cloth. The Iron Spider provided armour that could block bullets, multiple kinds of lenses for Peter to scan with, mesh underwings that allowed Peter to glide to the point of basically flying, and then, of course, the iconic mechanical arms that could pop out and attack Peter’s foes. Marks II, III, and IV of the Spider-Armour are actually already in the game, so it makes sense that we actually get the original now. The Spider-Armour was introduced briefly in the early ‘90s, and it was for one simple purpose: Peter needed to not be shot to death. Sure, he had Spider-sense that could let him dodge gunfire most of the time, but if he was actually shot at some point? All he’s wearing is cloth. 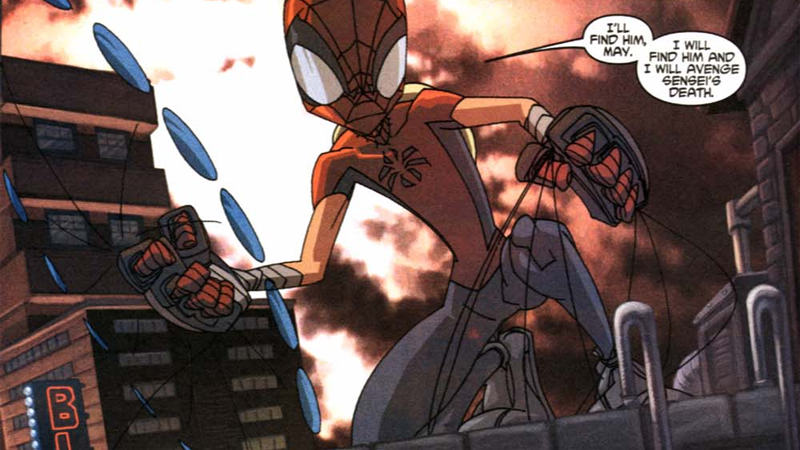 So when the New Enforcers attacked New York in Web of Spider-Man, he developed what is basically his own shining knight in armour, made out of a metallic compound Peter researched himself at university. Although the Spider-Armour I could block high-calibre rounds from guns, it reduced Peter’s mobility significantly—something he would go on to fix in later iterations of the design. 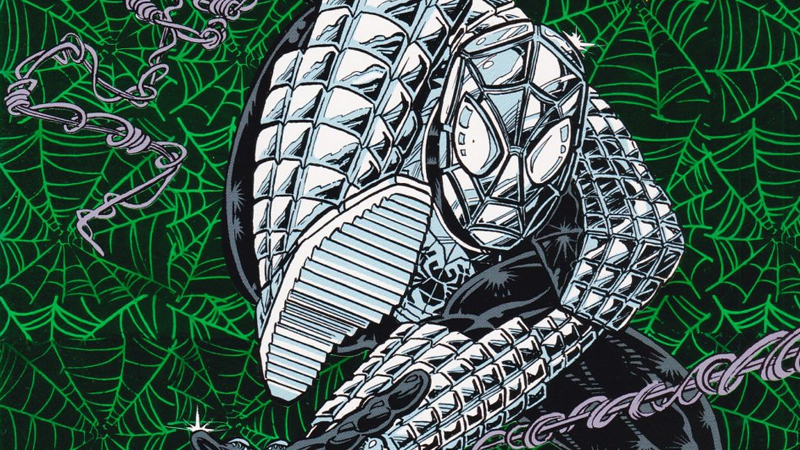 The original Spider-Armour did its job, but it was ultimately destroyed in Peter’s battle with the Enforcers...because while it could stop bullets, it couldn’t stop acid. Whoops. The Mangaverse was first created in 2002 as one of Marvel’s many attempts to flirt with manga and anime fans by offering stylised takes on its famous characters. 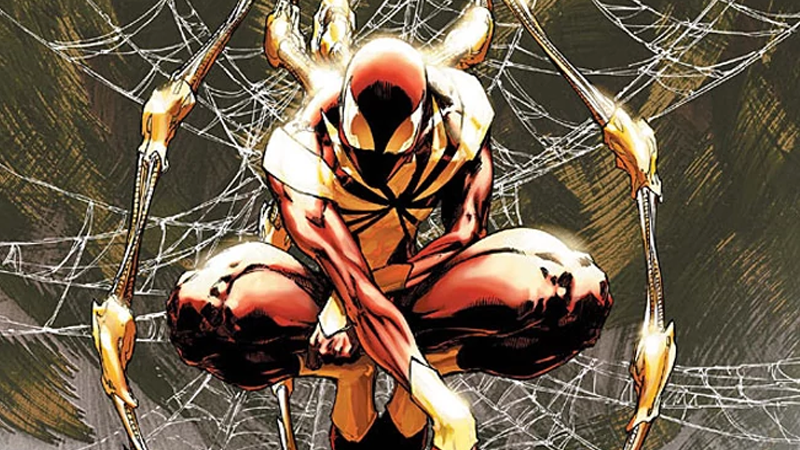 Designated as Earth-2301 in the vast Marvel Multiverse, the Peter Parker of the Mangaverse was a young teenager, the last in the line of legendary ninjas of the Spider Clan. Taught by his Uncle Ben in the ways of martial arts before Ben was murdered by the Kingpin, this Peter went on a quest for revenge, training himself in secret. He didn’t even have any actual Spider-Powers until Mangaverse’s second wave of “New Mangaverse” titles finally decided to let him shoot webs for good measure. As for the pastel cel-shading look the Spider-Man game gives the suit, it’s directly inspired by Kaare Andrews and Dave McCaig’s art in solo spinoff issue Mangaverse: Spider-Man, which adopted a flatter stylised look in keeping with the rest of the Mangaverse line. Hopefully it’ll look just as rad as the vintage suit!